TOWCESTER TAXI AIRPORT TRANSFERS 01908 263263 RELIABLE ROAD TAXI TRANSPORT: Cabbie Group Action : Are we being led down the wrong valley to protect Mike Brown's TfL ? Cabbie Group Action : Are we being led down the wrong valley to protect Mike Brown's TfL ? When Tennyson penned the searing words about the disastrous Charge of the Light Brigade, he was – like the poet laureate’s angry readers – demanding answers to one of the most pressing questions of the day: who/what led to the slaughter. But, Captain Louis Nolan thought he was a battle tactician and led the charge down the wrong valley. Ring any bells here??? 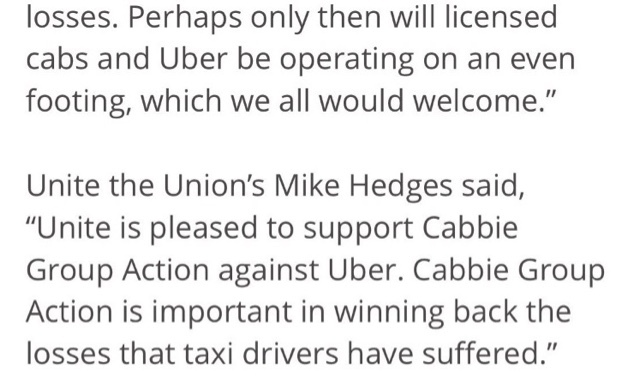 Funny, the man who thought the three drivers taking Uber to court, (who eventually settled out of court), were wasting their time has suddenly had a changed of mind !!! Try this one: No action can be taken against Mike Brown’s TfL while the case against Uber is running because it might prejudiced the case....in the eventuality of Uber settling out of court, probably for a lot less than the £500m stated this morning, no case against TfL would be viable. 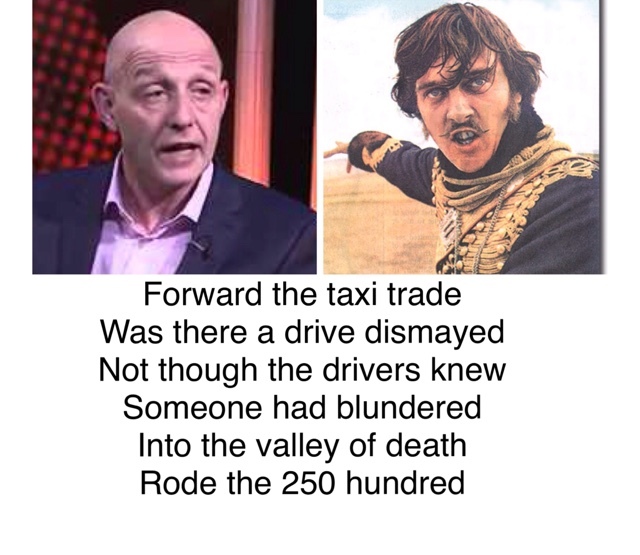 Are we being led down the wrong valley to protect TfL ? 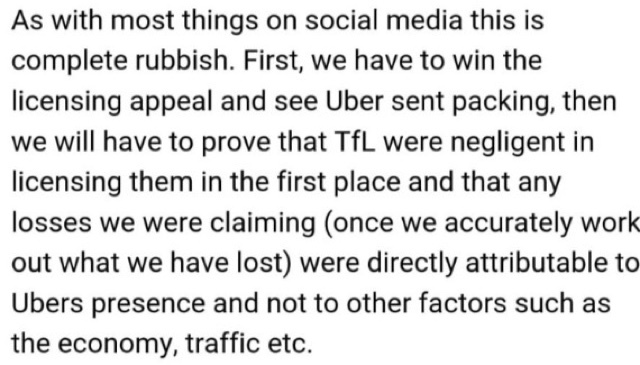 TfL are the guilty party here as they allowed Uber to continue to operate for six years knowing that it was the driver who accepted the booking (admitted in court), Uber’s operation was illegal ? Another question you might like an answer to before signing up for this action...Uber made Deloitte sign a non disclosure agreement over their second report ? You can’t see it, even the LTDA can’t see it ? TfL cannot themselves dissect it ? People are rushing in to sign up but wouldn’t it be a good idea to take some form of legal advice first? Looking at the FAQ's : If you decide this action’s not for you after you’ve initially committed, it may incur a cost ? It is not about 'loss of earnings' - it's about recovering what was stolen from us. Our Group Litigation should be for £1.5bn. It was announced on Wednesday that this 'unelected' group would sue for £1bn. Now it's down to £0.5bn. We should be suing TfL. We are charging down the wrong valley. CwP or Ernst &Young would do it this way. As a professional with own vehicle (or rented) a professional is recognised in these matters as at £30 ph. They'll gauge that at "gentleman's hours"; 40 hours pw. We would judge this to be 40% (LTDA say 30%). Whichever it is, Uber owe every driver that percentage. The sums come out around £1.5bn (£1.7bn). This is NOT loss of earnings! Some drivers didn't lose earnings. They worked longer hours and lost valuable family time causing stress, having to work 40% longer. Some lost houses, wives, their kids once a fortnight, and some their lives. Many have left the trade because of the hardship! PH, garages, apps, etc., must take a different suit to ours. For damage to their livelihood and business and shouldn’t be included in any claim made by the drivers. 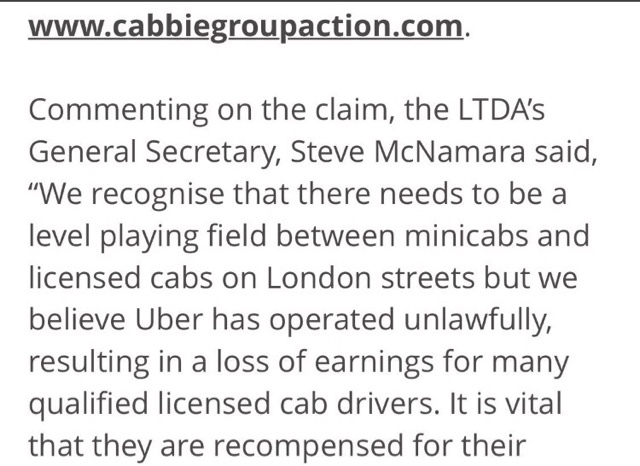 Is the reason McNamara wants to sue Uber, so that it will be settled out of court for a great deal less! And to protect TfL ? Is he using the other Orgs to give himself legitimacy. News this morning from the ITA, who have said, they will take an injunction against this suit, if need be! WE SHOULD BE SUING TFL! Cabbies didn’t study The Knowledge of London for three years to operate on an equal playing field. 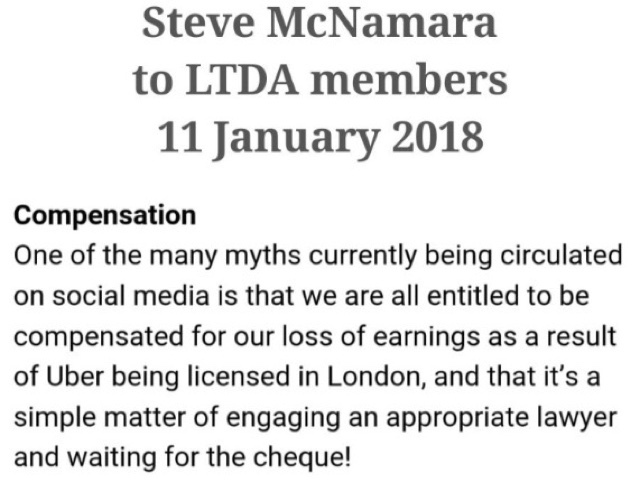 The LTDA should be calling on Transport for London to reinstate the demarcation between taxis and PH, and drivers should be recompensed for losses and damages incurred as a result of Über’s operation being licensed illegally.